Glassblowing is hot! So, I like to protect myself from the heat, and for me that includes wearing both a long-sleeve cotton t-shirt (or during the winter a long-sleeve cotton sweatshirt), and a baseball hat. The long-sleeves also are good protection when putting pieces away in the annealer. You want to wear cotton, in case you ever get hit with flame, the cotton might burn, but it won’t melt to your skin like synthetic fabrics. 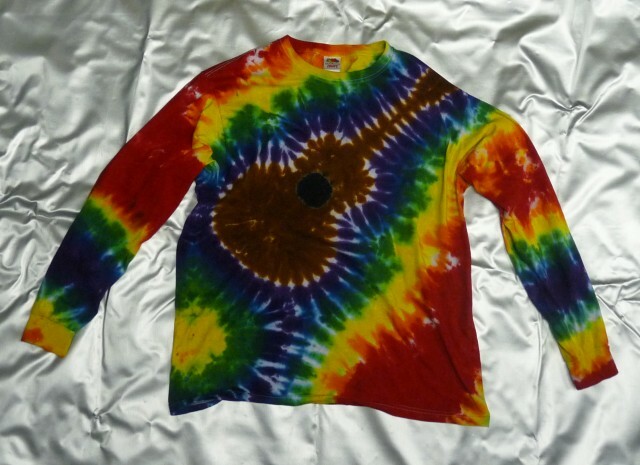 I have a web page dedicated to various t-shirts which have a glassblowing theme, but the purpose of this blog is to talk more generally about long-sleeve t-shirts, for their protective qualities, and especially beautiful tie-dye long-sleeve t-shirts. This beautiful long-sleeve tie-dye t-shirt was purchased from SPIRAL DYES at the 25th Annual Mushroom Festival in Kennett Square PA held during Sept 2010. SPIRAL DYES is run by Teresa Ramsay of Hot Springs, NC and I have to say, this long-sleeve rainbow guitar tie-dye t-shirt is the most beautiful tie-dye t-shirt I have ever seen!